Since entering a Georgia prison in 2012, a transgender woman has been denied the hormones she needs to maintain her gender identity. The SPLC today demanded that prison officials provide the therapy or risk a federal lawsuit. When Ashley Diamond was sentenced to prison, she didn’t realize the state of Georgia would force her to change her gender as well. But since entering prison in 2012, the transgender woman has been denied the female hormones she has been receiving for roughly half her life. With each passing day, she has watched her body change. Her voice has deepened. Her facial hair has begun to grow and her body fat has redistributed. Her identity is being erased. 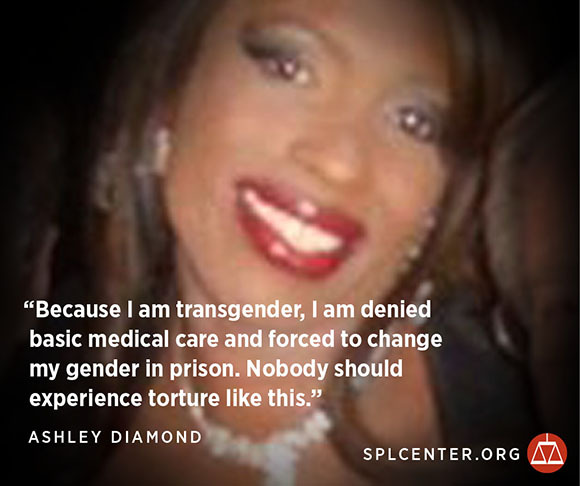 In a May 13 letter to Georgia’s prison commissioner, the SPLC demanded that Diamond and the state’s other transgender inmates receive the necessary hormone therapy and mental health care or risk a federal lawsuit. The Georgia Department of Corrections’ (GDC) actions violate the Eighth Amendment’s ban on cruel and unusual punishment as well as the prison system’s own policies, which require maintaining the treatment Diamond has received since age 17. The need for transgender inmates to continue such hormone therapy has been recognized by the National Commission on Correctional Health Care and the National Institute of Corrections. Federal Bureau of Prison standards require that inmates in Diamond’s situation receive hormone treatment and access to mental health providers familiar with transgender care. Diamond continues to experience physical illness, depression and suicidal thoughts as a result of the lack of treatment. She also has been targeted for physical and verbal harassment by guards and inmates. When she filed a lawsuit on her own behalf to receive the hormone therapy, the GDC moved to dismiss it rather than provide the treatment. After Diamond met with SPLC attorneys in December 2013, she was placed in solitary confinement for six days and then transferred to another facility. The move was classified as “disciplinary” despite the lack of any disciplinary incident, according to the letter. Her attorneys were unable to contact her during this period. Transgender people often encounter discrimination and prejudice, particularly black transgender people, such as Diamond. The National Transgender Discrimination Survey found that 41 percent of transgender respondents of color said they have been arrested or held in police custody due to bias against their identity. The survey also found that 39 percent of black transgender respondents said they have been denied a home or apartment because of their gender identity or expression – double the rate for all transgender people (19 percent). Almost half of all transgender respondents (47 percent) said they have had an adverse job outcome – such as being fired, not hired or denied a promotion – because they are transgender or gender nonconforming.